iCushion LED Pillow | OhGizmo! The holidays are just around the corner and since there aren’t enough “i” products going around I thought you would like this one. The iCushion takes 4 AAA batteries and puts on a show!! 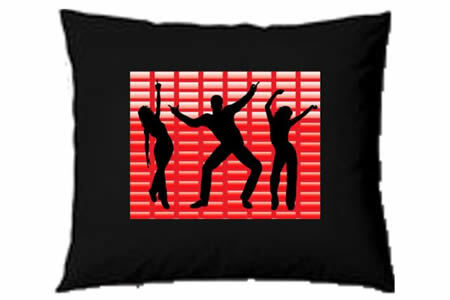 You just turn on the music and the graphic equalizer (that’s right a real graphic equalizer) on the pillow flashes with the rythm of the music. It costs about $50 so its more of a novelty item than anything, but it does come in four different colors to tickle everyone’s fancy:; red, purple, blue, and green. Go get your boogie on; you know you want to. Umm… where are the sliders for the graphic EQ? Is there a closeup of the line in/line out ports? How does the EQ sound? WHY would an EQ flash? Or… did some idiot marketing hack confuse a graphic equalizer with a spectrum analyzer? this is actually an electroluminescent technology, and JTode is technically right, but what you can expect to see is the paper thin panel flashing at different levels according to the amount of volume it picks up. Its fun, its gadgety, and its bloody huge right now.